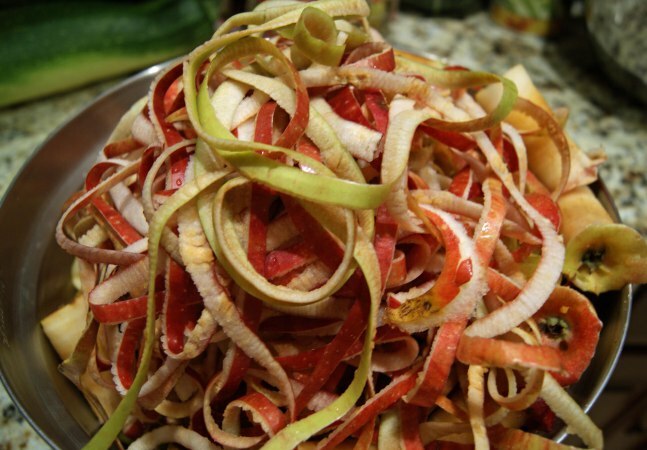 One of the byproducts from making applesauce is a whole big pile of cores and peels, which ends up in the compost. However, in some of my recent explorations, I ran across a method (check out the book Wild Fermentation) for making vinegar from scraps of fruit – the skins, seeds, pits, cores, and other stuff that doesn’t typically get used. Since it’s easy and makes something for free that I’d normally pay for, it sounded like a winner in my book. So the other night, after finishing the applesauce, I got started with the vinegar. I used a gallon jar, but any size will work, just adjust accordingly- fill it about halfway with your scraps, then top off with sugar water (1/4 cup sugar or honey per quart of water – for a gallon, I needed a little over 3 quarts). Cover with a dishcloth or cheesecloth (something not airtight, so the good things floating around in the air can get in), then set aside in a cool, dark place for a while. I’m not sure how long it should take, because mine’s only a couple days old, but based on what I’ve read, it should take a few weeks, give or take. I’ll be sure to update as soon as I have something. I never thought I’d get into the vinegar business (as with many, many other things) and again, here we are. A friend of ours asked, maybe a year ago, if we wanted a bottle of red wine, saying, half-jokingly, that maybe I’d turn it into vinegar or something. I declined. Today, I’d take it and would turn it into vinegar. I guess the joke’s on you. Will the madness ever stop? I recently made pear vinegar, using the same method, but adding organic apple cider vinegar. It helps the fermentation along quicker. I also made red wine vinegar and it tastes so good! 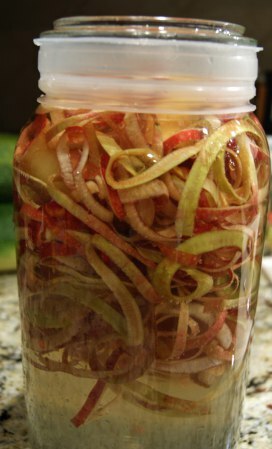 I will be peeling,coring, and slicing apples later in the week and I will use the scraps to make apple cider vinegar. I am like you, in that I’m doing things that I never thought I would or could! Blessings from Bama!